It was only a little over a month ago when Audi unveiled the all-new A7 Sportback and already we have the opportunity to check out the range-topping version out on the streets during the preliminary testing phase. Spotted in Spain, this is merely a test mule for the time being, so the final car won’t look exactly like this menacing black prototype riding on huge wheels. 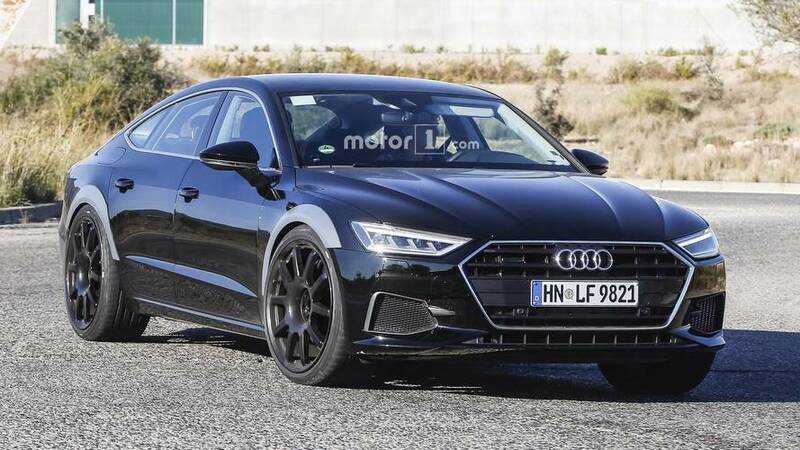 A closer look at the vehicle shows it has a slightly different front bumper compared to what we have seen in the official images released by Audi with the standard A7. The air vents are shaped differently while the rest of the bumper appears to be virtually identical. 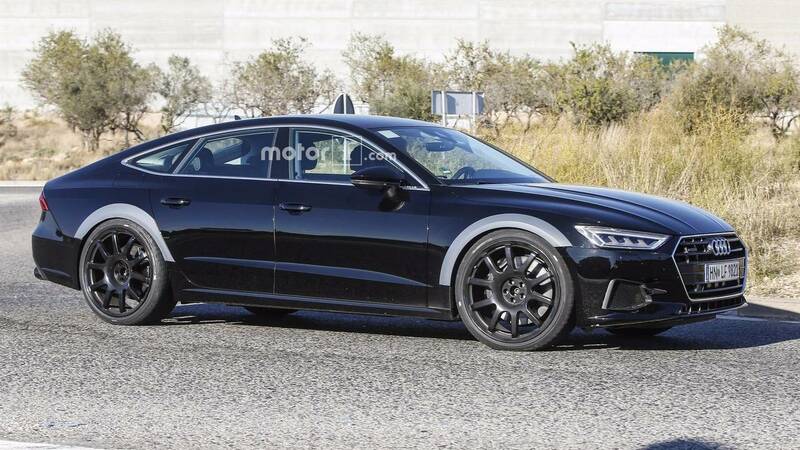 But it’s the side profile that provides us with a first clue about the car’s true identity as there are wheel arch extensions on both front and rear axles, thus suggesting the RS7 will benefit from extended tracks. Moving at the back of the car, the fat dual oval exhaust tips are typical for an RS-badged model and have been housed in the A7’s regular rear bumper with cutouts to make room for the beefier end tips. The production version will definitely receive a different bumper with neatly integrated exhausts that will likely flank a diffuser. As the spy shots are showing, the test vehicle was riding very low and those large black alloys barely had enough room in the wheel housings. Underneath the hood was likely a biturbo 4.0-liter V8 engine set to have somewhere in the region of 650 horsepower and almost 600 pound-feet (813 Newton-meters) of torque. 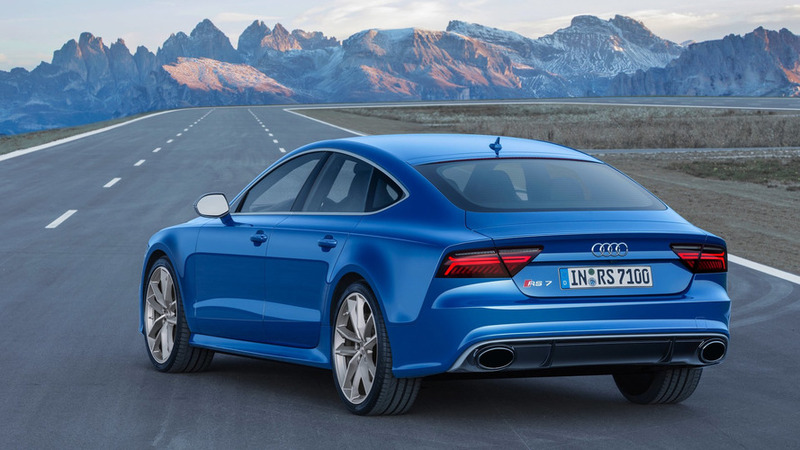 Audi’s chief designer, Marc Lichte, has already announced the RS7 Sportback will be out towards the end of 2018 and rumor has it there are plans for a more powerful hybrid version expected to hit the 700-hp sweet spot. Meanwhile, Audi is going to introduce the warm S7 probably in the first half of next year and some have suggested the engineers based in Ingolstadt might decide to install a diesel engine, but only after the launch of the gasoline-powered version.